Congrats, runners! View your 2019 Results and 2019 Race Photos. Looking for a training plan? Check out this custom made Stroehmann Bakeries Back on My Feet 5-Miler from Rich Ryan of Reinforced Running! Back on My Feet and the Clean Air Council are teaming up to offer you the perfect Broad Street Run training series. 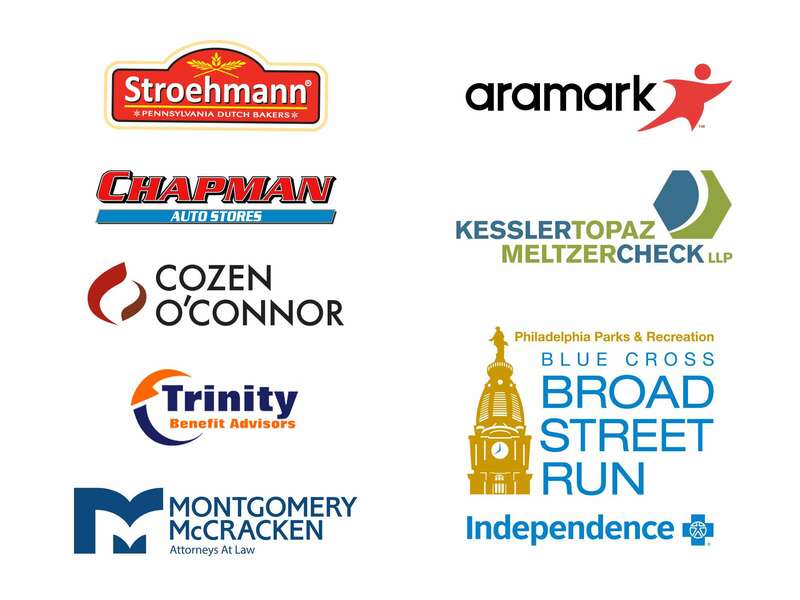 Join these non-profit organizations for the inaugural Philly Double officially timed by LinMark Sports. These organizations, committed to building a healthier Philadelphia, are offering some exclusive race swag and the opportunity to participate in two of the cities most meaningful non-profit races. What is the Philly Double? You’ll receive a special commemorative item for participating, exclusive only to Philly Double participant. By participating in this event you are investing in multiple organizations making our city cleaner, healthier, and stronger as a community. The 2019 Stroehmann BoMF 5-Miler will be timed by Lin-Mark Sports who will utlize the B-Tag from ChronoTrack Systems, the world’s most advanced timing system with the disposable chip. All participants will receive their assigned B-Tag affixed to their race number where it remains for the entire race – no shoe tags needed. During the race week entrants/famly/friends will be able to sign up for Athlete Race Tracking through Chronotrack Live to track their athlete(s) during the race – Finishers will have their results text to their mobile device within minutes after finishing. See our smiling faces when you arrive at the race start, located at the east end of the lower bridge (over the Schuylkill River at West River Drive). Once the gun goes off, you’ll be racing on West River Dr along the Schuylkill. The water stop comes just about 1.25 miles away, just before you make a left onto Sweet Briar Dr. A quick right onto Lansdowne Dr brings you face to face with a challenging uphill. At the top of the hill, you’ll be rewarded with spectacular views of the Please Touch Museum, which you will get to examine even closer as you make a right on 41st followed by a quick right onto the Avenue of the Republic and then a left onto Sweet Briar. Once you go around the Sweet Briar loop Circle, you’ll be able to open your legs up down the nice, long Black Rd hill. Go left on West River Dr. At the turnaround point you’ll be a little bit more than 2 miles from finish. As an added bonus, you’ll get to pass the water stop with about 1.25 miles to go for a flat, fast finish! We’ll have a high five for you waiting at the finish! The Kid’s Run is FREE but does require sign-up ahead of time or on race day. On race day, registration for the Kid’s Run will be located by the Starting Line. The Kid’s Run is a 100m dash (50m out, 50m back) starting at the Race Starting line at 7:20am. Holly Waters of Fitness Alive will lead our youngest racers in this event!! Participants ages 1-12 are welcome! Above 12? 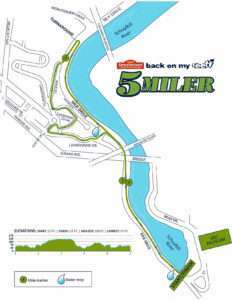 Join us for the regular 5-Miler! Back on My Feet will be holding a ShoeBox shoe drive collection at The Stroehmann Bakeries Back on My Feet 5-Miler! Our goal is to reach 3,000 pounds collected! ShoeBox Recycling is proud to be a for-profit recycler of shoes. They have flipped the recycling triangle upside down and have mastered the most powerful ‘R,’ REUSE, with all of the shoes collected destined for reuse by those in need of affordable footwear. With over 300 million pairs of perfectly reusable shoes hitting landfills each year, they are looking to change the way people think about their shoes. ShoeBox gives $.50 per pound back to Back on My Feet. Our goal is to raise 3,000lbs of shoes on race day! The good news is that the shoes can be any types (sneakers, work boots, etc.). Arrival: Shoes will be accepted until 7:15am. 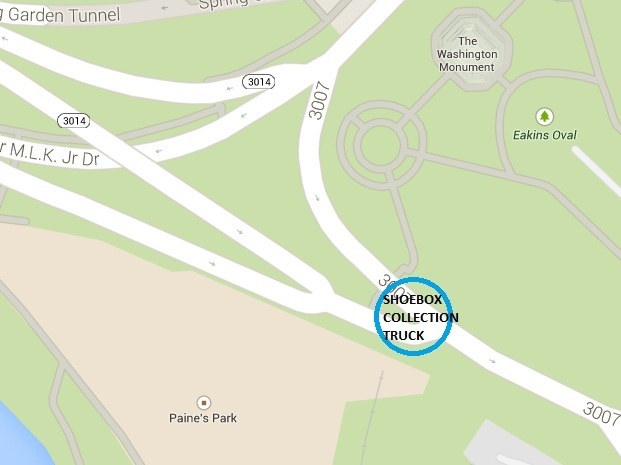 Drop-Off Location: Next to Paine’s Park there will be truck with a drop off area for you to stop along side and bring any larger loads from your vehicle. Instructions: Please label your bag legibly with your first, last, and email and phone to be eligible for a prize. If you would like to set up a collection drive outside of the event at your school, company, etc. please visit our website: here. If you are training for the Blue Cross Broad Street Run on May 1st this race is for you! To learn more about how to start a running team at your company, email rebecca.little@backonmyfeet.org. View And Purchase 2018 Race Photos! 2018 Post Race Results Can Be Found Here! If you would like to have a friend pick up your race packet they will need your registration information, a written note, and a photocopy of your ID. *Note: Race day packet pickup will also be available beginning at 6:00 am. No awards will be given for the Kid’s Run. All participants are winners! With an earlier start time of 7:30AM, please plan to arrive to the race by 7AM to provide ample time to line up! The PATCO Speedline is an easy way to travel between southern New Jersey and Center City, with trains running approximately every 20 minutes on weekends. Get off at the last stop at 16th and Locust Street and hop a cab to the art museum. The ticketing system does not take debit or credit cards, but takes bills and change – a round trip ticket ranges from $2.80 to $6.00, depending on where you get on the train. Please see all map locations with a ‘P’ for parking. Free street parking on the East side of the river is noted. *Again, the start/finish will be located on West River Drive on the West side of the Art Museum. *ANY CARS PARKED ON THE GRASS WILL BE TICKETED. Located directly behind the museum, on the west side of the main Museum building. You may access the lot via Art Museum Drive or Waterworks Drive. Race registration will be available at Packet Pick-Up at Philadelphia Runner Center City AND University on Friday, March 29th from 11am – 6:30pm and on-site on Race Day from 6:00am – 7:00am. What is the schedule on race day? 6:00-7:00 a.m. Packet pick-up, bag check, race day registration and shoe collection open. 7:15 a.m. National Anthem . 7:25 a.m. Race announcements from LinMark. 10:30 a.m. Bag check closes. Please be sure to pick up your belongings before this time. Back on My Feet Philadelphia is not responsible for any items missing or left at the race. *PLEASE NOTE THAT THE RACE WILL BE TIMED BY B-TAGS AND OVERALL MALE AND FEMALE FINISHER WILL BE TIMED BY GUN TIME. DON’T FORGET TO SIGN UP THROUGH OUR CHRONOTRACK SYSTEM FOR TEXT, FACEBOOK OR EMAIL ALERTS OF YOUR RACE START, HALFWAY, AND FINISH TIMES! How can I follow race updates, sign up for contests, and learn more? Does the Stroehmann Bakeries Back on My feet 5-Miler benefit any charity? All proceeds will go directly to Back on My Feet Philadelphia to help a Member experiencing homelessness take steps to become self-sufficient. Learn more about Back on My Feet Philadelphia here. I am unfamiliar with the area, where does the race start? Our race is located at the Schuylkill Trail Connector (on the South Side of the Art Museum) near the Pavilion and new skate park. If you are facing the Art Museum steps, walk to the left through the tunnel. Will there be gear check at the event? Yes. Participants can check their gear at the race start. Back on My Feet is not responsible for the loss, theft, or damaging of any personal belongings. Please arrive early to ensure a prompt race start. Where can I pickup my packet? Does Back on My Feet offer any training opportunities? Yes! More information to come! The Stroehmann Bakeries Back on My Feet 5-Miler will be timed by Lin-Mark Sports, Inc. of Mantua, NJ, utilizing the Chronotrack Timing System. The disposable Chronotrack B-tag will be attached to your race bib and will remain there for the entire event. On race day Lin-Mark will be posting results live on their website as every 50 persons finish the race and race results will be available at the start. Check here for weather history. How can I volunteer for the race? Simple, head over to our volunteer tab (above), fill out the form, and someone will contact you soon after. When coming from Lemon Hill Drive or Lloyd Hall, follow Waterworks Drive toward the Art Museum, which turns into the Schuylkill Trail. When coming from Kelly Drive or Fairmount Ave, walk around to the West side of the Art Museum via Art Museum Drive or Kelly Drive. 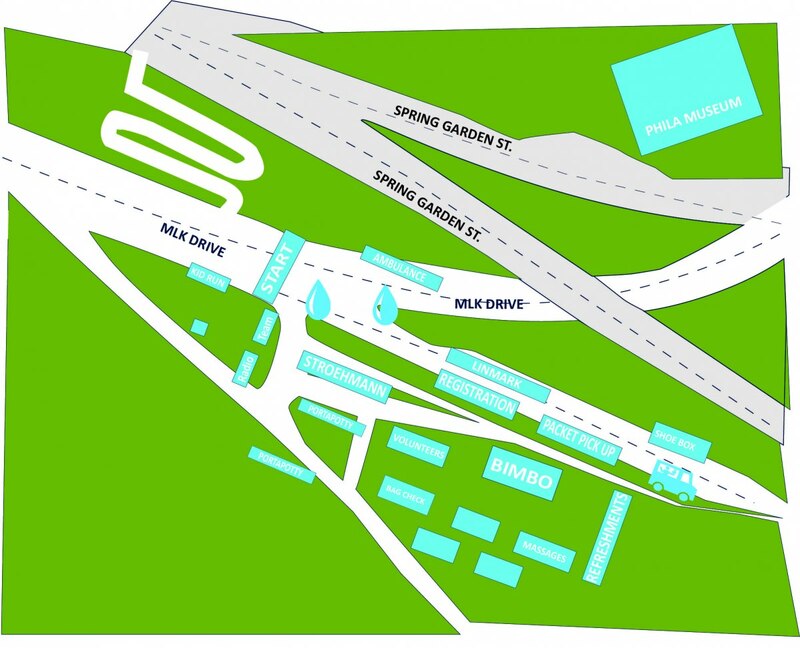 For more details, please refer to our race map. There is metered parking available along Benjamin Franklin Parkway, Spring Garden, and 22nd Street. There is also a parking area at Benjamin Franklin Parkway & 26th Street. There is a large parking lot at Lloyd Hall accessed by Waterworks Drive, just off Kelly Drive. This parking lot is heavily used, with time limits. Additional on-road parking can be found along Kelly Drive (Boathouse Row and along Sedgely Drive-opposite Lloyd Hall) as well as along Fairmount Drive (near our post-race event) and on Lemon Hill Drive. There is also a small free parking lot near the boathouses on Kelly Drive. You may also take public transportation to the race using SEPTA. Are strollers and dogs allowed? Yes, but we ask that you start at the back of the crowd! Announcing the second annual Back on My Feet Team Challenge! Table of spreads to accompany your post-race bread! Team Challenge winners will be announced on Monday, March 18th. Just like a football huddle, we put our arms around each other and start each run with a circle. We invite you to join us at 7AM for our Back on My Feet pre-race circle. If you want a small glimpse of what it’s like to run with us Monday, Wednesday and Friday mornings, jump in our circle alongside Back on My Feet members, alumni, volunteers, and supporters as we get ready to race! We’ll cover any important announcements and conclude with the serenity prayer together (below). Why? The serenity prayer is an integral part of recovery programs like Alcoholics Anonymous and Narcotics Anonymous. And with ~75% of our members being in recovery, we want Back on My Feet to be a part of their progress and recovery moving forward. Join us on race day! We are excited to offer some special Back on My Feet merch at our 2019 5-Miler! All merchandise can be purchased through a suggested donation to Back on My Feet.We will be accepting cash or venmo donations. To venmo Back on My Feet: Download the venmo app for android or iOs. Search for @backonmyfeetphilly and put your merchandise purchase in the “memo” line. We are so excited to bring on McKeever Event Management this year at the Stroehmann Bakeries Back on My Feet 5-Miler! McKeever Event Management, LLC specializes in event development, operations and production. We have a unique urban running and triathlon experience, having produced over 200 sporting events in the United States and Internationally in Bermuda. MEMRACING is dedicated to the management, creation, and development of participatory & endurance sports including those of running, swimming, and cycling. Interested in bringing MEMRACING to your event? Visit their website! The app allows you to view the course map, register through the app, find your bib number, view your results and more! To learn more about corporate sponsorships, contact Back on My Feet Philadelphia’s Executive Director, Cathryn Sanderson, at cathryn@backonmyfeet.org or 609-933-4879.